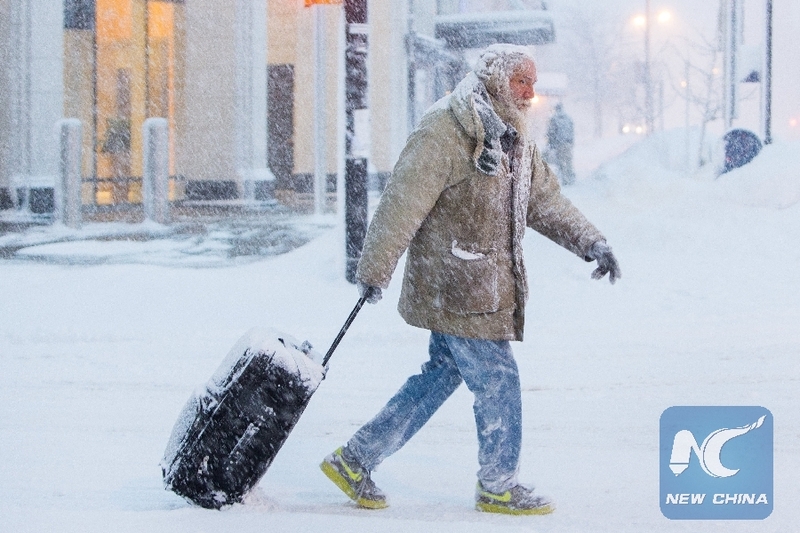 NEW YORK, Jan. 30 (Xinhua) -- The freezing weather caused by the polar vortex in the midwest United States expanded to New York on Wednesday with snowfalls and strong wind gusts, sending temperatures to the single digits Fahrenheit, or below -12 degrees Celsius. The National Weather Service (NWS) issued snow squall warnings for New York City and some counties in neighboring states of New Jersey and Connecticut on Wednesday. "A line of snow showers and/or snow squalls will move across the region this afternoon into the early evening," the NWS tweeted. A snow squall means a sudden burst of blowing snow, which arrived in the city around 3:30 p.m. (2030 GMT) and lasted around 30 minutes, causing trouble for evening commute. Meanwhile, Wind chill warnings and advisories are in effect for much of the tri-state area Wednesday night through Thursday morning. An arctic blast is also expected to hit the area Wednesday night with gusts up to 40 miles per hour, making temperatures continue to plummet, according to the NWS. New York City's Emergency Management Department issued a hazardous travel advisory for road traffic Wednesday afternoon, saying that the snow squall "may cause brief whiteout conditions, limiting visibility and making travel extremely dangerous." "New Yorkers should plan for hazardous travel during the evening commute and are advised to take mass transit where possible, delay travel or safely exit highways or roadways before the snow squall arrives," the department said. New York City Mayor Bill de Blasio also warned of an acute blast of cold air and snow earlier Wednesday. He advised people to stay indoors as much as possible. The city has issued a "Code Blue" alert, which means outreach teams will act more frequently to encourage homeless people to go to shelters. Major airports in the city were paralyzed due to the snow. According to the Federal Aviation Administration, flights at the J.F. Kennedy International Airport were delayed nearly two and a half hours while flights in LaGuardia Airport were delayed about 90 minutes. Temperatures are expected to pick up during the weekend to as high as in the 40s Fahrenheit, according to weather forecast AccuWeather. The cold weather in New York City with temperature expected to fall to a few degrees Fahrenheit above zero is very rare, said Ralley Horton, associate research professor with Columbia University's Lamont-Doherty Earth Observatory at a briefing on tipping points and surprises of climate change on later Tuesday. Horton warned that a small shift of conditions including changes in sea level really matters a lot for the frequency, intensity and duration of extreme weather.